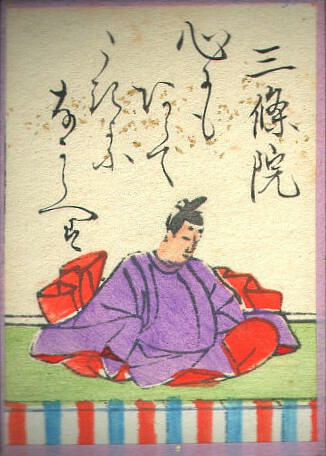 Emperor Sanjo as depicted in Hyakunin Isshu “cards”. the bright moon of this dark night! This poem was composed by Emperor Sanjo (976-1017) who only reigned briefly for 5 years until his regent, Fujiwara no Michinaga, forced him to abdicate so that his own grandson could become Emperor (Emperor Goichijo). Fujiwara no Michinaga will be remembered as the main character of Lady Murasaki’s Diary, plus he employed a number of the female authors in the Hyakunin Isshu to be ladies in waiting for his daughter. To make matters worse, Emperor Sanjo was frequently ill, and this added further pressure for him to abdicate. The poem above, according to Mostow, is thought to have been composed toward the end of his reign when he was ill and considering abdication. Was he concerned that night about his illness, or about the prospect of losing the throne? What made him savor that moon so? As mentioned in this post, the later poems of the Hyakunin Isshu reflect a more somber era when political scheming and such replaced the earlier enthusiasm of previous generations. By this time, the Emperors had lost much of their power to ministers (mainly from the Fujiwara family) and were increasingly isolated. The Heian Period which spans the Hyakunin Isshu would end about 100 years later. does the moon lodge, I wonder? The author of the poem, Kiyohara no Fukayabu, was a relatively well-known poet in his time, but it also turns out he is the grandfather of Motosuke (poem 42) and great-grandfather of Sei Shonagon (poem 62), so it seems poetry and literature run in the family. 😉 Then again, to be fair, the Hyakunin Isshu is full of poems involving members of the same family across multiple generations. Anyhow, as Mostow explains, this poem was highly regarded at the time, but for readers in the 21st century, it has so many hidden cultural allusions, that it’s hard to see the significance at first. As he summarizes, summer nights are short, and Fukayabu is saying that he is surprised that the moon is already dawning in the western sky. 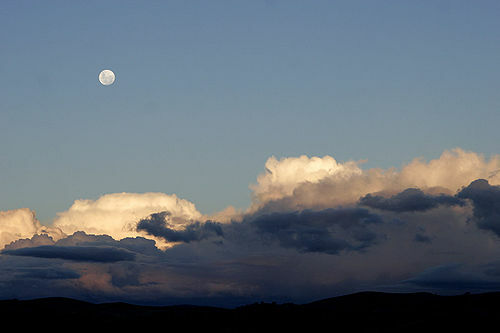 Since it’s cloudy, he asks where the moon might be lodging since it’s hard to imagine that it is already setting. It’s a clever, light-hearted poem exploring brief summer, moonlit nights in other words. Interestingly, Mostow points out that despite the praise on this poem from antiquity, Fukayabu was not included among the Thirty Six Immortals of Poetry and his reputation suffered a major blow that didn’t recover until it was included in later anthologies. It’s pretty amazing to think how a poem can really make or break a person in that era. New year is here, and I guess it’s time to say “goodbye” to the old one. This poem is also happens to be about good-byes of another sort. The author, Mibu no Tadamine, is one of the Thirty-Six Immortals of Poetry and was the father of Tadami (poem 41). He was also one of the official compilers of the official anthology, the Kokinshū along with Ōshikōchi no Mitsune (poem 29). By all accounts, this appears to be another famous “morning after poem”, similar to the one seen in poem 50. The term, ariake (有明) is a poetic term for the last-rising moon, in the last-half of the lunar cycle, which you can still see in the morning. On the other hand, as Professor Mostow points out, the fact that the moon was heartless could also imply lover who spent all night waiting to see his lover but was never received and finally went home at dawn. Either way, the morning moon seems to carry a lot of significance for romantic types back then. The author, Ōe no Chisato, is the nephew of Yukihira (poem 16) and Narihira (poem 17) and boasted a famous collection of his own called the Kudai Waka. Similar to poem 22, this poem has influence from Chinese Six Dynasties style, but as Mostow explains, the poem reflects a change where Chinese poetic style is adapted into more native Japanese style. Mostow explains that the poem may allude to a famous poetic line by Bo Juyi. As mentioned before, the moon plays a really important role in the Hyakunin Isshu, and poetry in general. But also, it’s a source of festivities too. In Japan, the 15th lunar day of the 8th month (harvest moon in the West), marks a fun time called o-tsukimi or “moon-viewing”. More on that in the other blog coming soon. As for the poem, it kind of expresses a quiet humility too, I think, which is why I always find it one of the most memorable. The Moon inspires a lot of deep feelings, but this poem reminds us that it does not shine just for us. the face of the midnight moon! Professor Mostow explains that the headnote for this poem describes an experience one night when Lady Murasaki had seen someone she had known long ago as a child, but she only saw them briefly in passing as they raced by. But there are many interpretations as to who that person had been. Many propose it was a fellow female acquaintance while others wonder if it was a male lover. Unfortunately we can’t be sure. Lady Murasaki, known as murasaki shikibu (紫式部) in Japanese, was a somewhat unusual figure in the 11th century Heian Court, both for her talents and her personality. Compared to other women of that era, like Lady Izumi (poem 56) who was very passionate, and Sei Shonagon (poem 62) who was very bold and witty, Lady Murasaki was more withdrawn and sullen and prone to be alone, or exchange letters with other women who shared her frequent melancholy. Unfortunately, we know very little about Lady Murasaki today, apart from her writings: the Tales of Genji, her poetry, and of course her eponymous diary which covers a year or two of her life while serving the powerful Fujiwara no Michinaga. I’ve explored her diary in my other blog at length, so we need not cover it here. We don’t even know her real name. The term murasaki (紫, “purple”) refers to one of her characters in the Tales of Genji, of which several drafts circulated the Heian Court and people started to call her by that name. Nevertheless, Lady Murasaki’s reputation has always endured throughout Japanese history as an author and poet of the highest caliber, and has a following even among Western audiences as well. She is celebrated and revered throughout the generations, and like Lady Izumi, enjoys a following in Japan among younger generations of women today. This page is a tribute to her as well. This is only for the Hyakunin Isshu of course. For larger anthologies like the Kokinshū and the vast corpus of Chinese poetry, the Moon is a persistent symbol of so many aspects of human emotion. mochiduki (望月) – full moon, 15th day of the old lunar calendar. izayoizuki (十六夜月) – moon on the 16th day, just after full moon. tachimachizuki (立待月) – moon on the 17th day of the cycle. A lot of these terms are pretty obscure (some I couldn’t find in a common dictionary), while a few like mangetsu and mikazuki are used in standard Japanese.